U.S. 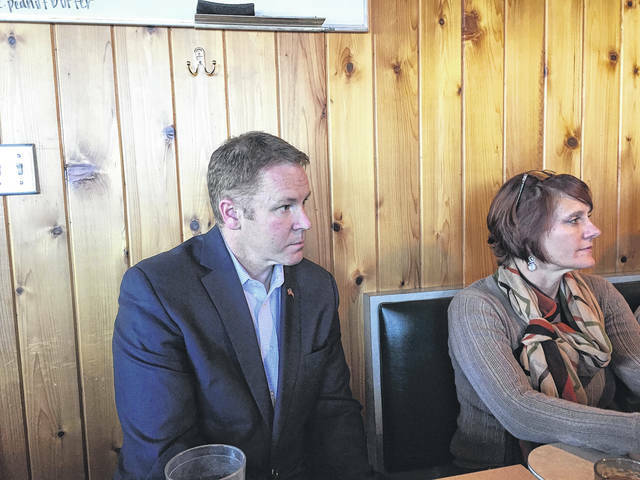 Congressman Warren Davidson (left) made several stops in Preble County on Friday, Jan. 26. 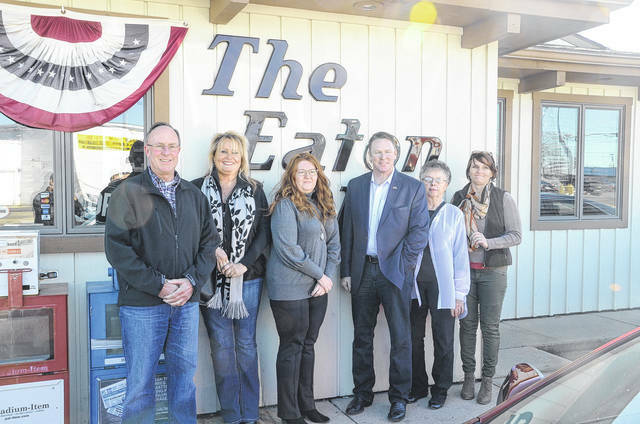 Pictured, he met with members of the Preble County Chamber of Commerce Board of Directors (Cindy Kaufman, right) at the Eaton Place. Pictured after a lunch meeting on Friday, Jan. 26, are Lewisburg Village Administrator Jeff Sewert, Preble County Economic Development Director Brenda Latanza, Preble County Chamber of Commerce Executive Director Leslie Collins, Congressman Warren Davidson, PC Chamber of Commerce Administrative Assistant Virginia Lindsey and L&M Products Business Manager Cindy Kaufman. Sewert, Latzanza and Kaufman are current members of the PC Chamber Board of Directors. PREBLE COUNTY — U.S. Congressman Warren Davidson spent time meeting with various individuals and visiting local businesses in Preble County and across the region in late January. One stop during his time in the community was a lunch visit on Friday, Jan. 26, with members of the Preble County Chamber of Commerce Board of Directors and Executive Director Leslie Collins. The group met at the Eaton Place in Eaton, a stop Davidson says is a familiar one for him when visiting the county. During the meeting the group shared information relating to various topics, including job availability in the county. Chamber board member and Preble County Economic Development Director Brenda Latanza discussed several large Preble County manufacturers’ plans for hiring and expansion. Preble County’s communities have seen an influx of new small businesses as well in the past year. Latanza and Lewisburg Village Manager Jeff Sewert, also a member of the PCCOC Board, shared successes for the Lewisburg region. Collins shared plans for the Chamber’s new Breakfast Briefing series and the upcoming Business Expo. Others attending the lunch meeting were Davidson’s Field Rep Ben Thaeler, Chamber Administrative Assistant Virginia Lindsey, and Chamber Past Board Chair Cindy Kaufman. Davidson also visited Rexarc International in West Alexandria and toured the facility on Jan. 26. Q: Where do you feel the overall economy is at today? A: The state of the economy is exceptionally good. If you go back a few years when we were getting 1 1/2 percent growth, we had a nice long cycle of slow, steady growth. Today, the economy is growing at more than double what we were told was the new normal. People made fun of Donald Trump during the campaign for saying he could get the economy going at 3-4 percent during his presidency. It’s growing at that in his first year. It’s got two quarters above 3 percent and the fourth quarter numbers haven’t been published yet but most people expect it will be high 3’s, low 4’s. So, that is in part due to the expectations going forward and a lot of the stock market appreciation is due to expectations of future returns. Another concern is the workforce. In the year ahead, all the data says that take-home pay is going up already And, is the economy in a state of flux … sure, technology is changing a lot and I think, trade is changing a lot, and I think President Trump is reacting as he said to address some of the trade issues. President Trump is taking a trip to Davos (this past week) to hopefully clarify that he doesn’t want to withdraw from the world community, but he wants to be focused on the U.S.’s role in that, which is different maybe than people have seen it for a little while. I’m a free trade guy. Big tariffs alarm me as well. But, if you look at the World Trade Organization, when you complain about subsidies to things like washing machines, eventually they’ll turn those off. But what happens in the meantime, they just dump even more. Steel is one of the worst, along with the metal stamping niche. The Chinese have over 50 percent of the world’s capacity for steel. So, they subsidize it, and when they get in trouble, they route it Vietnam in different containers and call it Vietnamese steel. Q: Do you believe there needs to be a change in the educational system to better prepare students for today’s workforce? A: I hope that this issue also will be addressed this year in a Career Technical Education Bill (the bill would increase funding reserved for career and technical education activities in rural areas and areas with high percentages or numbers of career and technical education students). I do think that we are so fortunate to have around this area some high quality education in our main schools. But like at the Upper Valley Career Center for example, you have such a huge range, but there’s this stigma with high school kids. It really hasn’t changed a lot since I was in school in the ’80s. I think the career awareness programs especially need to improve broadly. What you increasing realize is that people grow up and they know what their family knows. You may or may not know someone that is an accountant or an engineer or a social worker. Just getting kids the exposure to what is this career all about, what do these people do, that also is important. Q: How will the new tax reform affect people in your district? By the end of February, the IRS is changing the with holdings, and so people will see at least what the IRS withholds differently but of course then you fill out your taxes and then you see what it really happens. I think over the course of the year, you’re going to see it. Q: What are some of the cuts that people might see to social programs like Medicare or Medicaid? One of the biggest things you’ll see in social programs, though, is an increase in work requirements … when Bill Clinton was president, Congress worked with President Clinton and worked out a compromise when there were work requirements for able-bodied adults on TANF (Temporary Assistance for Needy Families) programs, which (is) cash-assistance, not every single thing…. When President Obama became president, Democrat majorities in the House and Senate, they eliminated work requirements, and that kind of made sense on a temporary basis anyway because we had a very tight economy, but they still haven’t gotten around to putting it back to the way it was … (Of people) who get Medicaid expansion dollars who are able-bodied adults, only 24 percent of those folks work full-time, so the work requirements from Clinton’s era seem timely given how hot the economy is. Q: What are legislators doing in regards to fix a provision in the federal tax overhaul that gave an unexpected tax break to farmers who sell their crops to cooperatives rather than private or investor-owned firms? A: There’s a lot of people that are dealing with this. There’s a 20 percent advantage to go a co-op. My understanding is that we are working on it and my concern is that if don’t do something swiftly, people are in the process of writing contracts right now so it’s going to be very disruptive. In the pass-through entity, which most farms are pass-throughs, if they agree to sell their grain through a co-op they can do the pass-through write off the 20 percent of the income. If they sell to a regular grain elevator, they can’t. So that’s massive difference. People are clearly going to change their behavior over that kind of ratio. And it’s also going to creative challenges. There aren’t enough co-ops to even process 100 percent of grain, that’s why the other places are in business. It changes the prices. I don’t know the back story of how it happened, but I do know it will be addressed.